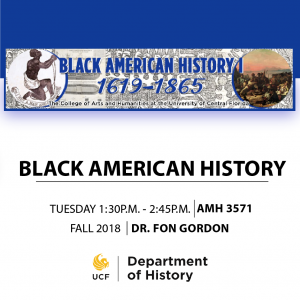 The UCF History Department has numerous, interesting courses being offered for Fall of 2018. Starting now, you can register for any of the following courses. Be sure to check beck regularly to see what new courses are coming this Fall. In AMH3562, we will unpack this historical statement and many other writings by and about American women. 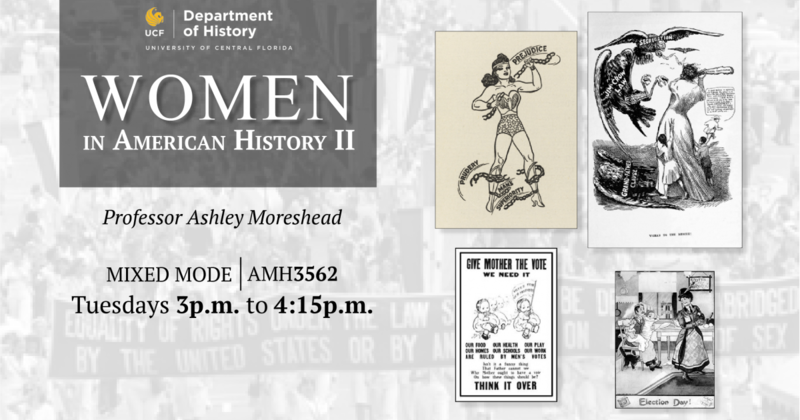 We will look at various depictions of women in popular culture and analyze the evolution of gender roles in U.S. society from the late nineteenth through the twentieth centuries. A major theme of the course will be the women’s rights movement, including the many different goals and strategies of women’s rights activists as well as the impact of racial and class differences on the feminist movement. This fully online course is insightful and highlights the rise of nationalism in Europe in the 19th century, that led to the development of the State of Israel. It focuses on the political and ideological struggle for the establishment of the Jewish state, emphasizing the forces that have shaped modern Israeli society and politics, culture, literature, and science. It probes the many cultural, social and geopolitical challenges facing the modern State of Israel, and examines possible solutions to multiple internal and external conflicts. This course presents an eyeopening journey that dovetails with issues in the forefront of today’s Middle East. This course offers a reading and writing survey from the Atlantic slave trade in the fifteenth century to the British colonial period in the seventeenth century and through the U.S. Civil War era in the nineteenth century. The first half of the course will combine both face-to-face (F2F) and online course content for the first half of the Black American History survey sequence. The banner represents the first text we will read. Find out what it means. This course examines the history of South Africa from 1652 when the Dutch East India Company established a refreshment station at Table Bay to the present. White settler colonialism and African resistance and resiliency over three centuries have shaped South African history. Also, the implementation of Apartheid and its consequential impact on African societies has been the defining event in the history of the country. Our journey will be guided by the following questions: What historical forces and peoples have shaped South African history? Was the development of the system of Apartheid inevitable? What was the nature of the system and how did it affect black and white South Africans? What was South Africa’s relationship with the states of southern Africa and the international community? What role did the United States play in dismantling the system of Apartheid? What were the internal and external forces that facilitated its demise? What are the prospects for a prosperous, democratic society in the post-Apartheid period? By the end of our journey, we may not have all of the answers to these questions, but we will be very clear about the critical issues and the significant factors impinging on them. 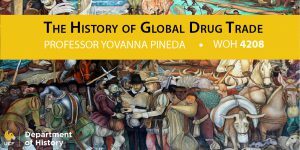 The History of the Global Drug Trade explores the political, economic and social struggles over the production, circulation, and consumption of drugs. We largely focus on the global trade of coca, distilled beverages, cannabis, opiates, and their related by-products during the nineteenth and twentieth centuries. We discuss the original medical purposes of drugs and their political, cultural, and social imaginations and controversies. Given how illicit drugs are a hot topic in our society, we will engage with historical and contemporary material, including discussing the ongoing “drug wars” in Mexico and South America. HIS 3462 explores the history of science from the Ancient World to the Modern Era. In this course we look at some of the major historical trends with regard to how both natural philosophers and the general public understood the world around them. We will also explore the evolution of science museums in the Modern Era. The larger goal of the course is that students will gain an understanding about the interrelationship between science and society, and how each shapes the other. Colonial America, 1607-1763 explores British North America from the period just before the colonies’ founding through the end of the French and Indian War. 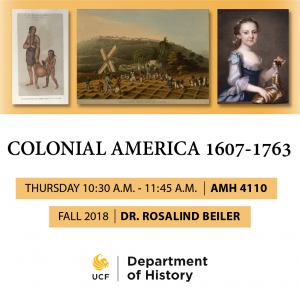 In this Fall 2018 course, students will examine cultural encounters between American Indians, Europeans and Africans and the societies they created in the seventeenth and eighteenth centuries. While many people in early America attempted to replicate their home societies, they also responded to their new circumstances in ways that helped to shape distinctively American patterns. By studying regional developments and their political, economic, social and religious configurations, we will trace the beginnings of cultural sensibilities that continue to inform our lives today.